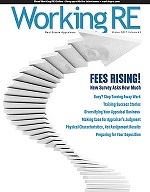 Now you see it, now you don’t: that’s what appraisers are saying about data that is disappearing or changing after a report leaves their desktop. Here’s what is happening and why, according to appraisers, vendors and other industry insiders. A certified appraiser, who wishes to remain anonymous fearing blacklisting, recently contacted her errors and omissions insurance provider to report a potential liability issue. Let’s call her Ms. Smith. Smith noticed a PDF report inadvertently attached to a request sent to her from an appraisal management company (AMC). When she opened the PDF attachment she noticed that her original appraisal was altered. “I clicked on the PDF attachment and found that it was a copy of the original appraisal that I had sent to them, except this PDF report was altered and my signature was gone. There was added data on several pages and several pages were removed including my cover page, letter of transmittal and the summary of salient features. Also missing was the additional active listings page. The active listings photo page was there but data was added,” said Smith.